The Shields Lab at Cornell University has provided an overview of the “Biological Control of Alfalfa Snout Beetle (ASB): An Update after a Decade of Nematode Applications” plus info on the 2019 ASB and Corn Rootworm Biological Control Program: Nematode Cost and Rearing Opportunities. Alfalfa snout beetle remains the key limiting factor to alfalfa standlife in the Northern NY region and frequently kills out entire stands or large portions of stands in a single year. 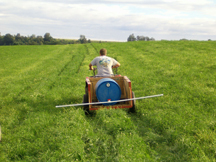 Since 2007, the Shields’ Lab has assisted NNY farmers in inoculating alfalfa fields using insect-attacking nematodes (bio-control nematodes) to suppress the spread of this insect with the long-term support of the Northern New York Agricultural Development Program (NNYADP)*. Between 2007 and 2018, biocontrol nematodes have been applied to more than 20,000 acres on more than 120 farms. In 2018, a total of 2,800 acres were treated on 46 farms across Jefferson, Lewis, St Lawrence, Franklin, Clinton counties. For 2019, the Shields’ Lab will continue to offer farmers the option to purchase bio-control nematodes or assist farmers interested in rearing their own nematodes on their own farm with their own labor. Click on the links above, for more information. *Funding for the NNYADP is supported by the New York State Senate and administered by the New York State Department of Agriculture and Markets.